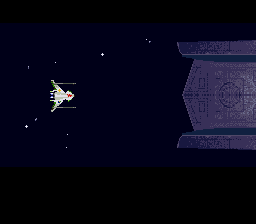 Wing Commander isn’t a game that would strike me as a natural to make the leap to consoles but despite this it got released on both of the major 16 bit systems in the early 90’s. The Megadrive/Genesis didn’t see it until the Sega CD add-on was released but the SNES got a port in 1992. 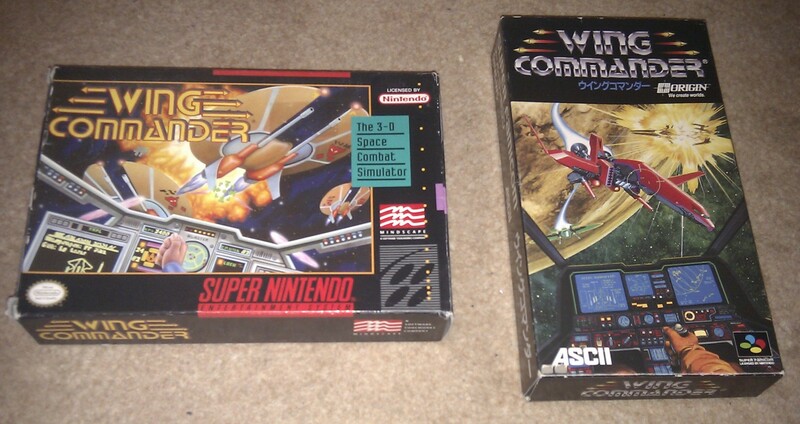 I’ve got two versions of this, with the one on the right being the Japanese release. I do like the artwork on this although I don’t recall any red fighters in the game. It also has some art in the manual which I’ve not seen elsewhere. The manuals are seriously cut down from the PC version with no blueprints or Claw Marks magazine. Assuming they aren’t already available on replacementdocs, I’ll scan both of these in eventually. I’ve been meaning to play this for a while with the initial idea being to play it on one of my handhelds. Unfortunately it refused to run correctly on both my PSP and Pandora using the SNES emulators. 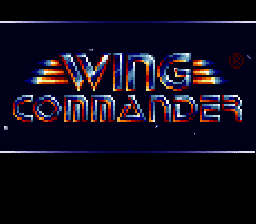 I was only seeing a letter or two of the Wing Commander logo when it zoomed in and space flight was equally strange. There would have been the option to use EA Replay on the PSP either but I don’t actually own it, so in the end I’ve opted to play it via my PC. This does at least mean that I can grab some screenshots along the way. On starting up the game, everything looks more or less exactly as it should and first impressions are good. The music is straight from the PC version. The SNES rendition can’t compete with the MT-32 but it’s not a bad alternative for adlib which is what most of us probably played the PC game with at the time. The conversations are straight out of the original word for word, and other than looking a little odd due to the more limited palette all the characters are the same old faces. 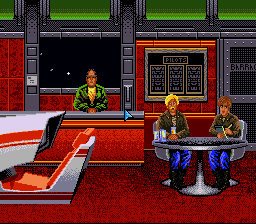 Elsewhere the storage limitations of the cartridge are evident, such as the briefing room where the sitting/standing animation has gone. This is no great loss and is compensated for by the launching sequence which is there in full detail and running smoother than the PC ever managed, thanks to the SNES’s gfx capabilities. Similarly the game looks better than I expected on launching. It’s when I start trying to play it that I began to run into problems. The first obvious issue is the lack of a keyboard to enter commands. This has to be substituted with button combinations which are going to take some getting used to. The system they’ve gone for is sort of intuitive with a modifier button held down in combination with the others to cycle guns and switch screen displays. 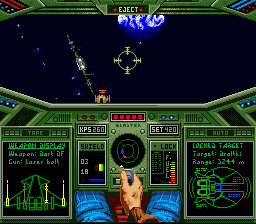 This is done about as well as would be possible with one button dealing with the left screen, one with guns, another missiles, etc. but it still feels cumbersome when trying to do anything during combat. With enough practice I should speed up however. The major issue is the lack of analogue controls. I did originally play WC2 on keyboard back in the day, but it was the game that persuaded me to buy a joystick so it was short-lived. I find it quite difficult to aim when I’m jumping around in large steps although I did get the impression that the enemy ships were less maneuverable to compensate. I wish this had been on the N64 instead but I’ll probably get the hang of using a d-pad eventually. 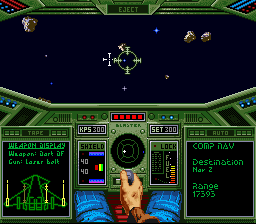 It just doesn’t feel like Wing Commander if you aren’t using a joystick though. Graphically, the game looks great. There is perhaps a little less detail than the PC but it moves more smoothly if anything and the differences are quite small. A few cracks start to appear once you get playing the game though. The 3D effect doesn’t quite work and objects appear to stay exactly the same size for ages and then suddenly grow just when you are about to hit them. In the asteroid field, the asteroids appear to slide around in independent rectangular blocks in a way that is impossible to describe. The impression is that there are a lot of tricks going on in the background to make the SNES able to play this game but it’s at some expense to the 3D realism. Having perhaps more impact on the gameplay, the radar in the center of the screen just doesn’t behave correctly. The blips jump around between quadrants rather than smoothly moving around and I found it difficult to judge where anything was. All of this could have been better on the real hardware of course, but I’m almost entirely biased toward home computers of one sort or another and not counting portables the only console I own is a Vectrex (which is kind of portable in a 1980’s way). 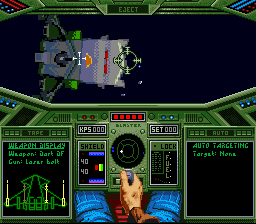 Considering how much Wing Commander I’ve played, you would not believe how difficult I found the first mission taking numerous attempts before I got through to the end and I barely made it back alive even then. Playing this has been almost like having to learn the game again. That one mission is as far as I’ve got for now. I’m just about mastering the controls and expect I should plough through the game fairly quickly. I definitely prefer the PC original but I’ll reckon I’ll enjoy playing this port and there may be a surprise or two along the way. I’m not going to blog my way through the whole thing as I expect it’s going to be 99% the same but will give my final impressions if I make it to the end. Speaking of the PSP, the EA replay compilation is pretty cheap and it has the SNES version of WC1 and SM1 on it… not sure what they do for emulation. I think this is a very faithful port. The only big changes would be some censoring. I think some squadron names are censored. The red ship on the Japanese box is a Gratha. What happened is that they asked the artist to paint Wing Commander ships and they gave him the Claw Marks’ line artwork as his reference. So while it looks nothing like the Gratha in the game, you can see how it looks like the one in Claw Marks with an arbitrary color added! 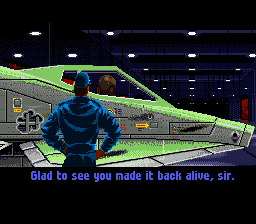 The FM Towns versions of Wing Commander I and II have similar paintings by the same artist and in the case of the latter you can see where it happened again. Armed with only the silhouette art from the Wing Commander II manual, he painted a Fralthi that’s the same /shape/ as the one in the game but with none of the same details or color. Anyway, what I wanted to say was that I would totally appreciate scans of the Super Famicom manual. 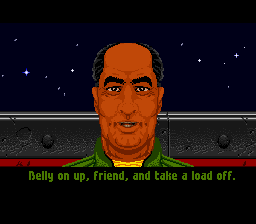 The Wing Commander SNES one is useless, but as you noted the Famicom version has all sorts of original art (in color!) AND it actually has material added. Some years ago I was digging through the timeline and noticed that there were extra events. I didn’t know what they were, of course, but they didn’t match the numbers in the original Claw Marks. I sent a picture to a Japanese-speaker and sure enough, that version of the game adds several events to the WC timeline that don’t show up anywhere else. No problem with the scans, I’ve been meaning to get them done anyway. It should only take 10 mins with such a small book. I’ve got a post to write first but I’ll get them up within the next few hours if you check back on the downloads page.